Klein conducted an energy audit and was able to develop a project plan to save over $2 million in net operating costs, as well as 3,000 metric tons of carbon emission per year. Jason Klein joined Verizon to help it progress toward LEED and Energy Star goals at its 1.4-million-square-foot campus in Basking Ridge, NJ. In addition, he hoped to help Verizon expand its nationwide Energy Champions program, an initiative designed to keep employees engaged in energy efficiency and affect long-term behavioral change. Though the facility's lighting and HVAC had already undergone energy efficiency upgrades, Klein found additional opportunities to reduce energy use after conducting an energy audit. He identified and recommended numerous projects, such as installing variable frequency drives and occupancy sensors in parking garages and stairwells; data center hot aisle/cold aisle containment; and swapping old bulbs with light-emitting diodes (LEDs). In terms of the Energy Champions program, Klein developed a strategic communications plan for the initiative, and rolled out the program to an additional twenty Verizon facilities employing around 37,000 workers. Klein's projects could save the facility $2 million in net operating costs, as well as four million kilowatt hours and 3,000 metric tons of carbon emissions annually. 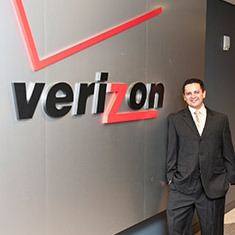 Jason Klein, a student at the University of California, Davis, was hired as the 2012 EDF Climate Corps fellow at Verizon.